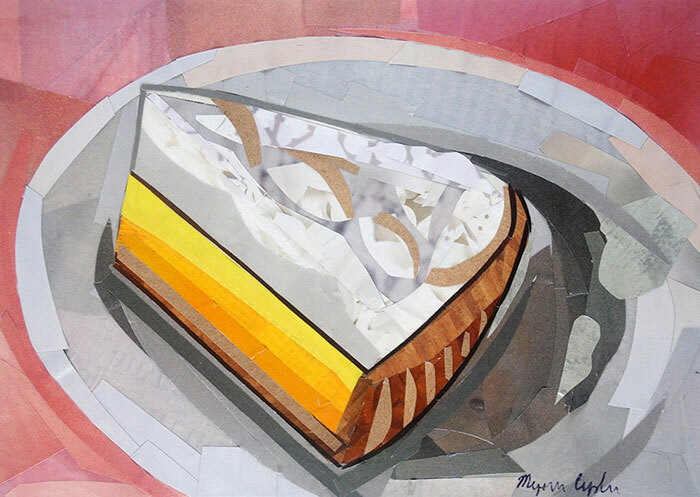 Lemon meringue pie is my favorite type of pie, so I just had to make a collage of it. Getting the texture for the top of the pie was the most challenging part of this piece. I had a lot of fun using different yellows for the filling, and of course creating some abstract shadows on the plate. I’m really enjoying tackling different desserts for my new still life series. I suppose previously when I tried to approach still life, I often got bored since I kept tackling floral arrangements. When you try to approach different subjects, it can really change things up, and make something that you typical found too ordinary, much more exciting. 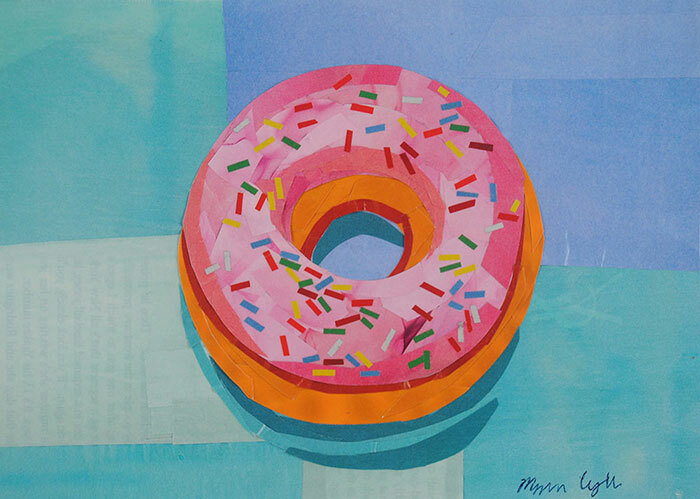 I’m planning to create a few more pieces for this series before I tackle another type of food for my still life work. I had a lot of fun working on this collage, and I’ve been getting a lot of joy from working on my latest series of minimalist desserts. I think I was previously focusing too much on animal portraits, and having more change in my routine helps get the creativity flowing. I’m planning to make a few more pieces for this series before changing gears again. 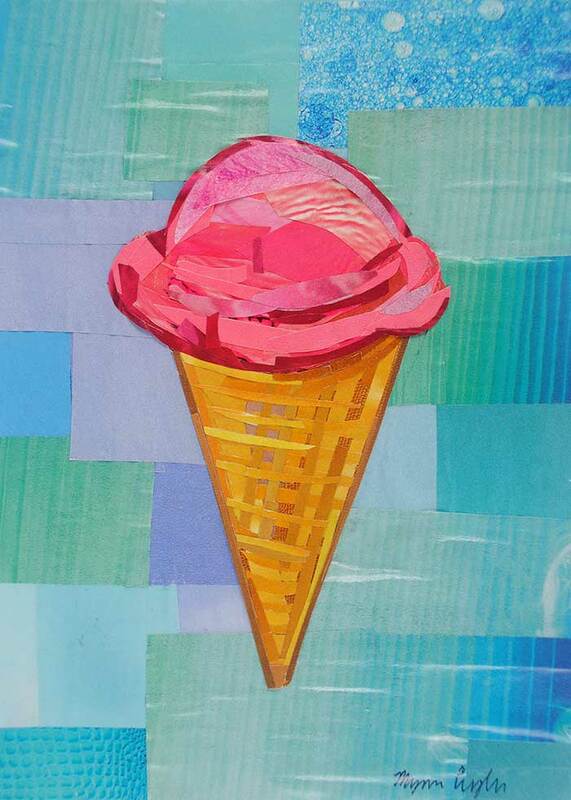 It’s been fun trying to find new ways to sharpen my collage-making skills. This piece of cake was pieced together rather smoothly. I think the most difficult part was trying to get the coloring for the background to work the way I wanted it to. Initially it was a more vibrant pink, although I wanted to find colors that were more subdued so that the cake itself would stand out more. You can also see that I focused more on finding solid colors from the magazine strips I layered, with only a few bits of texture. If you’ve followed my blog, you’ve probably noticed that the vast majority of my work focuses on wildlife. I’ve always had an affinity to animals, and I suppose that’s why time and time again, I’ve been drawn to making animal collages. However, lately I’ve wanted to change things up a bit. 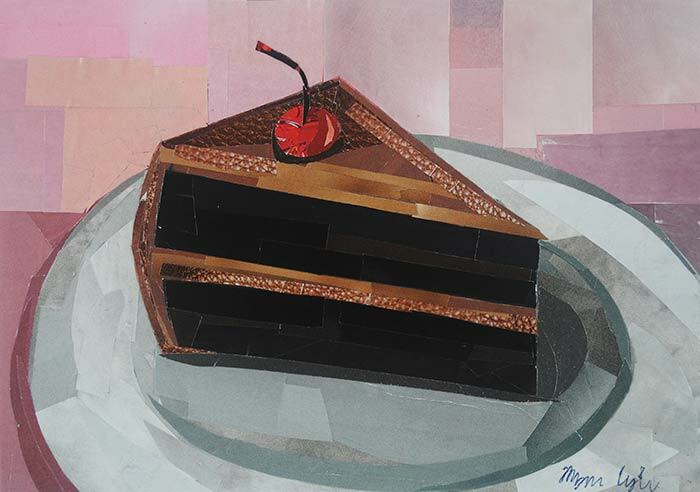 So right now I’m tackling a series of minimalist still life work, that explores various desserts. At some point I’ll want to explore other aspects of still life compositions, but for now, I’m going to keep it sweet with my focus on sweets. Over the past few months, I’ve made animal collage after animal collage. Animals have always been a favorite subject of mine, but I’m realizing that I need to change things up a bit more, and focus on other subjects that I’m not as comfortable with. Still life has always been a subject that I haven’t enjoyed tackling all that much, and I’ve had a tendency of avoiding it or not trying to see how I can make it more interesting. As an artist, if I truly want to grow and develop my skills in new ways, it’s best to get out of my comfort zone so I can see what happens. 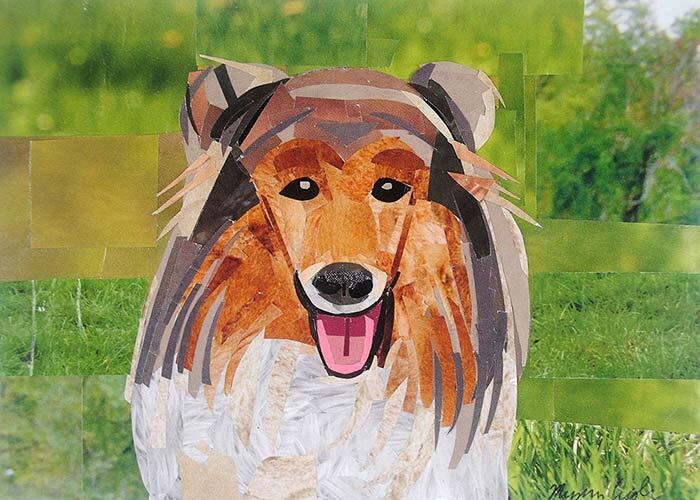 I haven’t explored collaging different dog breeds all that much, so the other day I figured I’d tackle a Collie portrait. I decided to use a simplified background with a warmer green, to create more of a contrast between the Collie and the background. I worked in bits of texture as well as solid colors, and I like how this dog seems to be smiling. It’s always good to explore different ways to tackle a medium. Sometimes I like to work with more patterns and textures in the magazine strips I use, while other times I like to focus mainly on solid colors. Other times I have no idea what direction I’ll lean towards, and that element of surprise is all the more reason why I continue to make collages. Long haired dachshunds are one of my favorite kind of dogs. This portrait was made as a gift for my boyfriend’s parents who got a long haired dachshund earlier this year. Their dachshund is a beautiful puppy who has a lot of energy, and I wanted to see how I could capture her likeness in collage form. It might be fun to explore different dog breeds in the future. But I suppose at the moment, I’ve got my hands full trying to tackle a number of projects. That’s one of the many great aspects of being an artist – having more ideas than you know what to do with. The other day, I wanted to get started on a new collage. I’ve been thinking that I really need to revisit still life, portraiture, or landscapes again since I’ve been focusing primarily on animals. 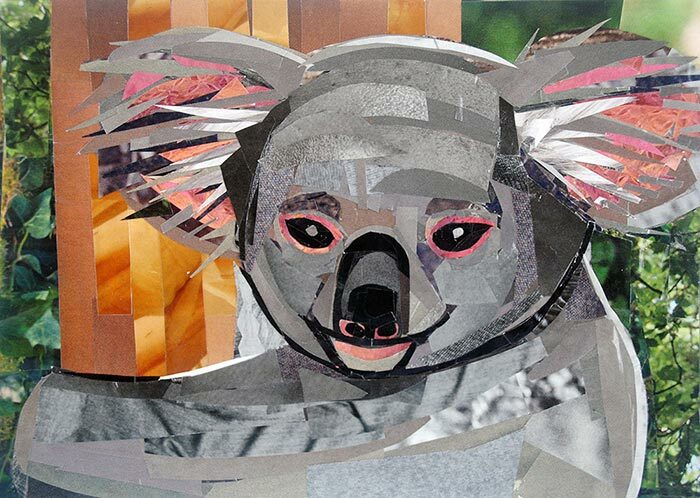 But then I remembered how much fun it is to make animal collages, so I decided to tackle a koala collage again. Working on this little guy wasn’t easy. I found myself realizing that koalas are pretty strange looking creatures – they look almost like mice with their rounded ears, and their noses are quite unique and unusual. I think I just haven’t really studied the features of a koala all that much, and realized that I was getting tripped up over the details in their quirky characteristics. Eventually I was able to layer the magazine strips in such a way that I was satisfied with the result. This piece is done…for now. 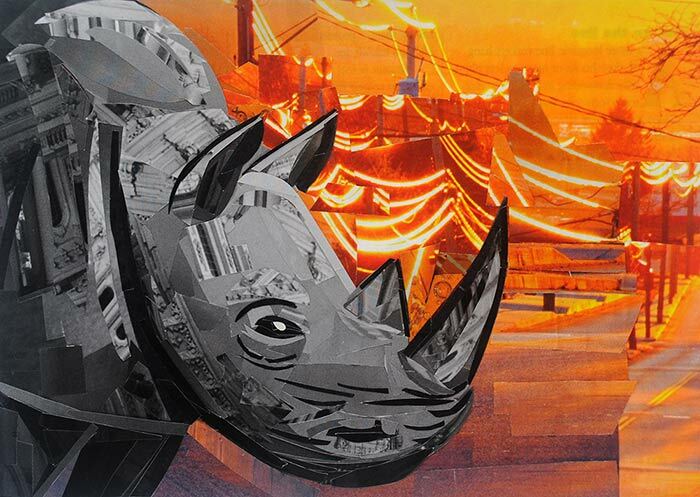 I’ve always thought rhinos were fascinating animals. They look like aliens in many ways, and for that reason, I thought I’d focus on their peculiar appearance when naming this piece. And sometimes you just want to have fun when titling your work! I also wanted to play around with layers, so this collage has more obvious layers than my usual work. 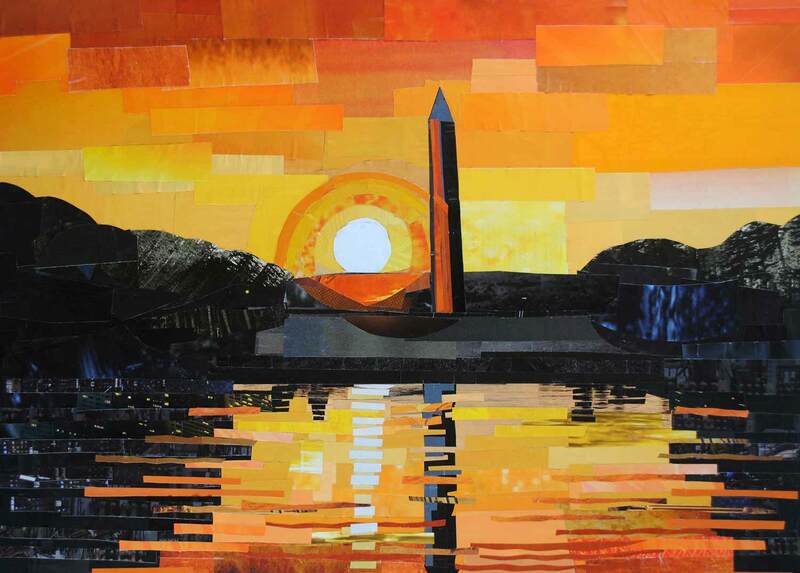 Typically my collages are pretty flat, while this one is raised in different sections. I think I’ll try to focus more on layers and texture for my next few pieces. 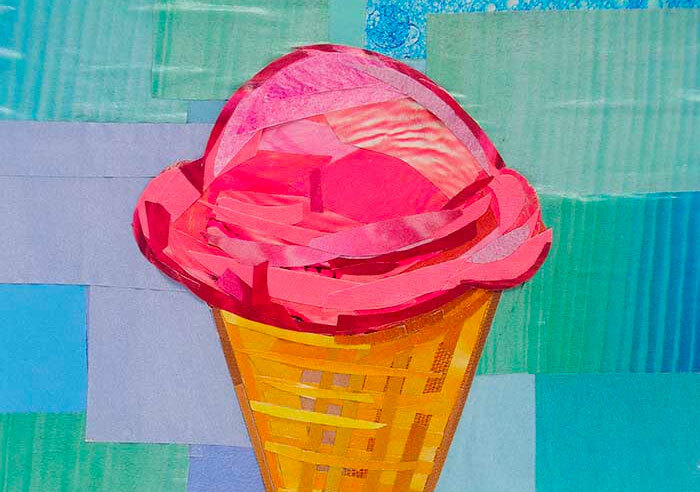 Lately I’ve been using more solid colors in my collages, so this time around, I wanted to mix in more textures. 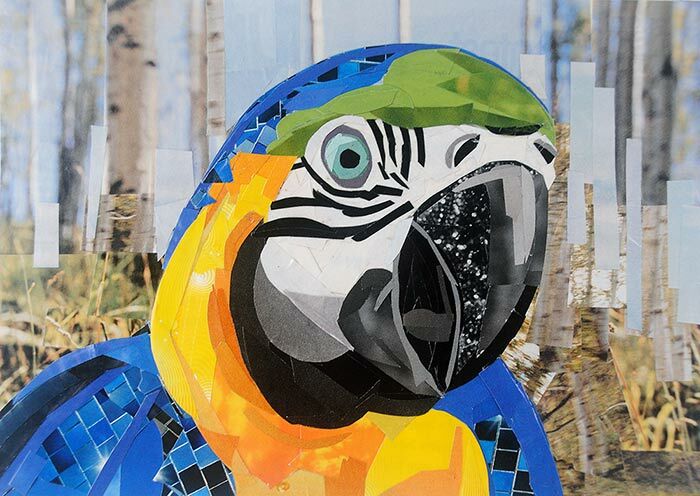 You can see that I’ve still used bits and pieces of solid colors, however the background consists of fragments of images of the outdoors, while the blue feathers and beak have a little more texture or patterns when compared to other areas of the collage. For the blue, I stumbled upon a blue tile-like pattern, and figured I’d see how it would look when I incorporated it into the piece. Sometimes I never know how a specific texture or pattern will work out until I layer it down on my artwork. I can always peel back layers if they don’t work out, so the process is always somewhat of a journey. This piece was inspired by one of the many visits I’ve made to a zoo. Zoos are the easiest way for me to see exotic animals in-person, where I can take lots of pictures to later use as references for my artwork. I’m drawn to making animal collages because I love how much variety there is when it comes to animals. They come in so many shapes and sizes. Each species has its own expressive quality and personality with whatever shape and form they take. As a child, I used to be a bit of a nature kid. I loved animals, loved reading about them, visiting them at the zoo, and buying knick-knacks and souvenirs of them. I used to spend hours playing outside, playing games with my imagination where there were always some sort of animals present. And I suppose today, the way I stay in touch with that part of childhood, is by continuing to create different images and depictions of animals in my artwork. 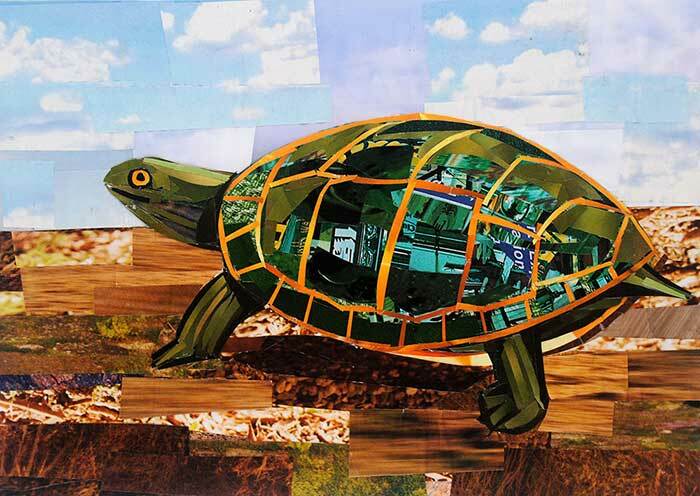 This turtle collage is another example of how I’m continuing to explore compositions of different animals, as I continue to play with texture and solid colors to construct each image. For the background, you can see that I used fragments of images that had clouds and terrain in them. For the turtle, I focused on various solid greens, and made sure the shell had fragments of texture from images of street signs and shrubbery. Overall, I had fun making this piece – at times it was a bit of a struggle, but I’m happy everything got pieced together in the end.